Lean Thinking: Does Lean Really Apply Outside of Manufacturing? Does Lean Really Apply Outside of Manufacturing? Is Lean just a Manufacturing thing or does it apply outside of the factory? Many companies have made great improvements in Safety, Quality, Delivery and Cost by applying Lean principles and techniques to their Manufacturing operations. But do we see the same huge improvements when we apply Lean outside the factory? I often come across organizations that have made huge gains in their Manufacturing operations but are reluctant to go farther and apply the same Lean principles outside of Manufacturing. Some go so far as to apply Lean to their Warehousing and Transportation networks as they connect their Manufacturing operations to their Customers but most fall short of making a true value stream where value is flowed from Suppliers all the way through to Customers. They are happy with where they are but unfortunately can’t reap the benefits of applying Lean to the other main parts of their enterprise including Design & Engineering processes, Sales & marketing processes and to their support operations like Finance, Human Resources, and Information Technology. They never get to form a true value stream and they limit their ability to drive increased value propositions to their Customers. Make no mistake about it, there is synergy that comes from applying Lean to all areas of the enterprise. The improvements are multiplied and new ways are constantly found to reduce waste in all parts of the enterprise driving more and more value through to Customers. Why do companies behave this way, when the potential gains are so huge? I don’t have any definitive research but my instincts tell me, that driving improvements in manufacturing processes that we can see in one thing and people can grasp it but driving improvement in invisible office processes is another thing and most people, no matter how smart they are, have trouble with this concept. How do we see a Design process? How do we see a product promotion process? How do we see a year-end close process? We need to make these invisible processes, which reside mainly in the computer - visible. The trick is to make office and knowledge work processes visible. Try getting a team together and mapping them out. You’ll be amazed at the waste you find and after you take that waste out, you’ll be amazed at how much more waste you find. A value stream is both material & information flow. If we only improve the material flow, we’ll reach a point where materials flow faster than the information they need to go to the next operation. Information becomes the bottleneck and so becomes the next area of improvement. Does Lean apply outside of Manufacturing? Absolutely! 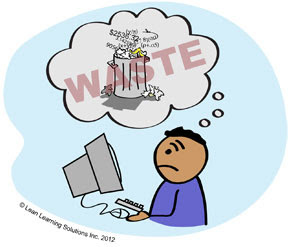 We just have to learn to see and make visible the waste in these processes. For an answer to your question, see "The Marshall Model". I had to do some research into the Marshall Model to find out what it is. Interesting concept of rightshifting and organizational effectiveness. In summary - yes - applying Lean outside of Manufacuring does lead to higher levels of organizationsal effectiveness.